The New Forest is perhaps best known for its deer. 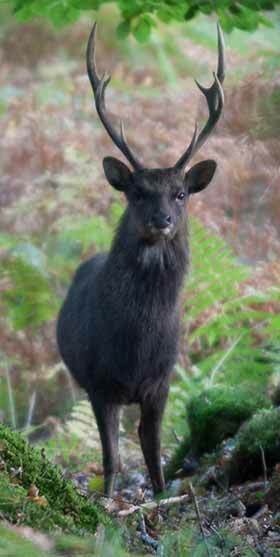 Fallow deer, red deer and roe deer are fairly widespread and can often be seen; whilst sika deer are found in reasonable numbers, but generally only in the south of the area. Muntjac deer are also present, but these tiny creatures are secretive and rarely seen, although their barking calls can sometimes be heard by those who regularly venture out into the woods. Badgers are reasonably widely distributed, and so are foxes and rabbits, although in the New Forest, the latter occur at lower densities than in prime habitats elsewhere. (Perhaps surprisingly, animals of all three species often share the same tunnel system). Grey squirrels are successful colonisers despite sometimes determined attempts by man to keep down their numbers. Sadly, however - as is now well-known - grey squirrels and red squirrels are unable to live together, and so when the grey squirrels arrived, the local red squirrels were driven out, could not compete for food or living space, or, more probably, fell victim to disease brought in by the interlopers. Hedgehogs are scarce on the Crown lands of the New Forest - there is little suitable food for them - and hares are very rarely seen, probably for the same reason. Mice, voles and shrews also occur only in modest numbers compared to many places elsewhere – heavy grazing by deer and commoners’ stock, and the consequent removal of ground level vegetation, does not suit them - and stoats and weasels are largely absent. Bats of a variety of species, including the nationally rare Bechstein's and Barbastelle bats, are, however, present, sometimes in good numbers, but, of course, these flying mammals of the night skies are only likely to be seen or heard by enthusiasts out after dark.